I looked around online and I decided to add pureed veggies to the mac and cheese. Now I needed to find a plain flavored veggie packed with nutrients. I settled on butternut squash. It fit the profile of plain flavor, has an orange color (the usual color of mac & cheese), and its loaded with good healthy stuff. 2. Boil water. While waiting for water to boil, cook butternut squash. I throw it in a pot with water and cook. Cook until tender. 3. Once water boils add pasta. Cook according to box instructions. 4. Puree cooked butternut squash with about a quarter of the water it cooked in. I use an immersion blender but anything that will puree will work. Set to the side. 5. Add butter and cream cheese to a sauce pan, Medium heat. Let it melt. 6. Once butter is mostly melted add butternut squash puree. Mix together. 7. Around this time you may be ready to drain your pasta. Do that and set to the side. 8. Back to sauce pan add salt, pepper, and old bay to taste. I use about ½ TBSP old bay and pepper, a little less salt. Mix well. 9. Add you cheese to sauce and mix until melted and well combined. 10. Once combined add pasta and toss until coated. 11. Transfer to a baking dish. Sprinkle panko on top if you want. 12. Bake in oven for 10-15 minutes. We love this Mac and Cheese in my house. It is still cheesy, comforting and delicious with that extra kick of healthy nutrients. The little ones have no idea, it’s awesome! 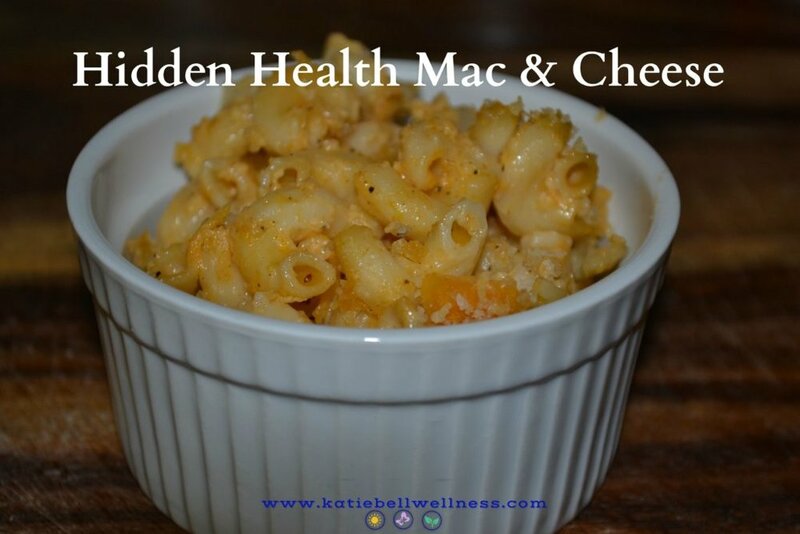 Its your turn…get the kitchen and make some Hidden Health Mac & Cheese!